In this article, we will show you how to use FedEx Shipment Tracking and FedEx Pickup features with the WooCommerce FedEx shipping plugin and Shopify FedEx App. Read along to know more. Can you provide FedEx shipment tracking and raise FedEx Pickups in WooCommerce? WooCommerce’s a great platform to sell your products online. But to ship products to your customers, you’d have to display a Flat Rate or rates from a shipping carrier like FedEx and UPS. The WooCommerce FedEx Shipping plugin is the best option for WooCommerce users who want to ship items using FedEx services. With this plugin, you can display live shipping rates, print shipping labels, enable shipment tracking, offer FedEx Freight services, schedule FedEx Pickups, and more. To have a better understanding of the features provided by this plugin, we should consider a real business case. For that, let us take an example of one of our customers trying to figure out the plugin. Customer’s request: l would be happy to purchase this plugin if I could find the following features. 2) Creating shipments with FedEx C.O.D. We choose FedEx Priority Overnight or FedEx Standard Overnight as per the weight slab, I am not able to find details if the product has C.O.D. option. We create shipment that requires scheduling a product with pickup location address, which gives us a pickup confirmation number. This pickup number is sent automatically to the local area manager, according to area code and address. This helps them to pick up that product to deliver it. You can view the order details as soon as an order is placed. You would find them under the Orders section of the WooCommerce option, under the Dashboard. Let’s take the following order as an example. As you can see, the order has been placed with FedEx Standard Overnight selected as the shipping service. The corresponding shipping estimate can be seen right next to it. Creating shipment with FedEx C.O.D. Now to formalize and create this shipment, you’d have to scroll down the page and click on the Create Shipment. Refer to the image shown below. This step is important as it allows FedEx to generate a unique Shipping ID. This ID can be used by users to track shipments. Moreover, you can even choose to enable the C.O.D. option as shown in the image above. And if you want to change the service for some reason, you can choose to do so. After creating the shipment, the page refreshes and you would see options to print the shipping labels. You would also find the package information along with the tracking details here. Refer to the following image. The arrow above shows the FedEx shipment tracking ID. Furthermore, this identification number is automatically generated by contacting the FedEx servers and every information regarding this shipment is stored in their systems. In order to track the shipment, you can go to the order page and then go to the right side of the screen. You would see a box something like shown below. Note: We are using the tracking number, 123456789012, for demo purpose. A working tracking number can be only be obtained when you have the FedEx Production credentials with you. If you have executed the previous steps correctly, then you should be able to see the tracking ID of the shipment under the Enter Tracking IDs area. This ID is automatically filled in and you don’t have to manually enter the number. To track the order/shipment click on the Save/Show Tracking Info. If you click on the shipment ID link above, it takes you to the FedEx page. Correspondingly, this page directly shows the tracking details of that particular order. You can refer to the following sample image. Customers also receive a confirmation email including the shipment tracking ID. The email would look something like shown in the following screenshot. You can schedule FedEx pickups for your orders. This feature is seamlessly integrated with FedEx services and offers a great solution to your shipping ways. Let us look at the pickup setting section of the FedEx plugin. These options are available in the FedEx settings page under the WooCommerce settings. Click on the Enable Pickup option to enable FedEx Pickup. You can specify a different address for the pick up by the option under the enable option. Moreover, you can specify the pickup start and close time of your company as well. 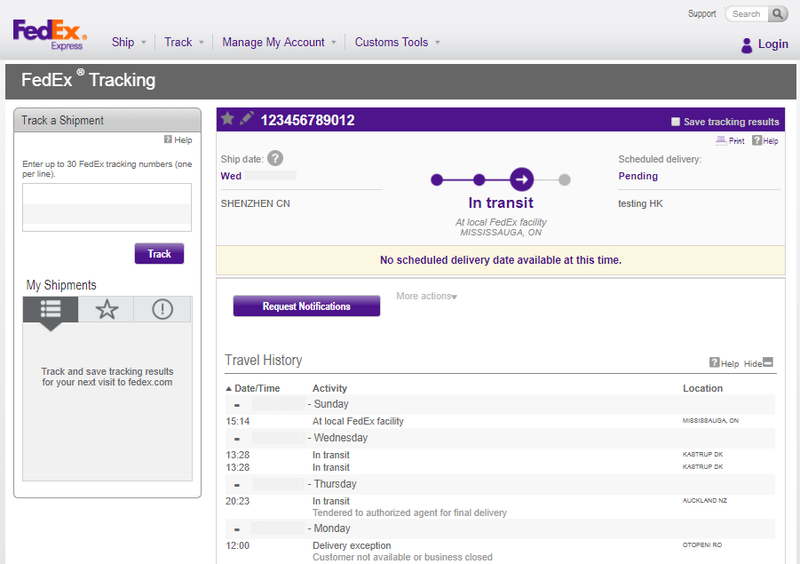 The plugin allows you to select the FedEx pickup service and you can do that from the drop-down menu shown in the image. Following are the FedEx services offered by FedEx for pickup. Now under the Orders page, you would find all of your WooCommerce orders. You can either choose to enable FedEx Pickup individually or in bulk. Let’s take an example and raise a pickup request for the following order. Doing this refreshes the page and you can see the Requested comment under the FedEx Pickup column. And there you go. You have successfully raised a FedEx Pickup request. Can you provide FedEx shipment tracking and raise FedEx Pickups in Shopify? Yes, you can, but only with the help of Shopify FedEx App. The App comes with both FedEx shipment tracking and FedEx Pickup as built-in features and you can easily configure them. Once you have configured the App, you should be able to fulfill an order. So for the sake of explanation, let’s assume we received an order where the customer has selected the FedEx Express Saver shipping method. The App will create the shipment once you click on the Auto-Generate Label option. This will trigger the App to generate FedEx shipping labels and enable order tracking for this order. In the image below, you can see the option to track the order and download the FedEx shipping label. Upon clicking the Track Order option, the page takes you to the FedEx tracking page where you can track the order. Your customers too can track their order on this page which can be accessed directly from their order email. You can use the Shopify FedEx App to raise FedEx pickups for your orders. The App allows you to set the Pickup start and company close time, choose the Pickup service and select the pickup location as well. Under the Settings page of the App, you would find the Pickup option as shown below. So once an order is ready for pickup, you can select the order under the orders section. Once selected, you will have the option to Request Pickup as shown in the image below. And once you initiate the Pickup, you can check out the status of the pickup at any point in time. Below is the relevant FedEx Pickup information regarding the same order. Have a look. Both WooCommerce FedEx shipping plugin and Shopify FedEx App are amazing solutions for your online business. They give you the ability to manage your FedEx shipments, provide real-time tracking to customers, and schedule pickups directly from the store. And the complete shipping experience is seamless even if you have hundreds of orders. We hope this article would have helped you. If you have any query regarding this article or setting up FedEx shipping on your online store then feel free to contact our support. They should be able to help you out.